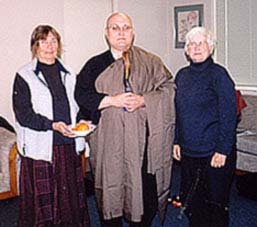 Recognizing the need for a spiritual community in these difficult times, members of the Dharma groups founded by Taigen Dan Leighton in San Francisco, San Rafael and Bolinas organized the Mountain Source Sangha, in order to expand and deepen our efforts of enacting the wisdom and compassion of the Buddha into our daily lives. Up until 2007, our groups were carefully guided by Taigen, a Zen priest and Dharma heir in the Soto Zen lineage of Shunryu Suzuki Roshi. We are now lead by Shinko Rick Slone. Our practice includes weekly zazen, monthly one-day sittings, dharma talks and discussions as well as other Dharma events. Our practice, done in a spirit of collaboration and friendship, is based on the idea that our work benefits not only ourselves but also all others both inside and outside the community. 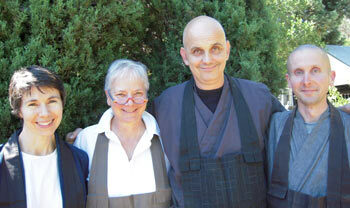 (l) Sessei Meg Levie, past teacher at Bolinas; Kiku Christina Lehnherr, past teacher at San Rafael; current teacher Shinko Rick Slone ; and Luminous Owl Henkel, past teacher at Bolinas. We invite everyone who is interested in Soto Zen practice to join us-either informally making donations at each event or through monthly financial contributions. While we would be grateful for contributors who are able to make substantial donations, we welcome everyone as participants regardless of their ability to contribute as we wish to make the Buddha's teaching accessible to all.